The only ingredients needed when boiling fresh beets are water and a splash of lemon juice or vinegar. Olive oil is the only ingredient needed when roasting fresh beets, although many home cooks give them a sprinkling of salt before cooking. The ingredients added during the cooking process affects the color of the cooked beets. Acidic ingredients such as lemon juice or vinegar helps them to retain their bright color. Salt added at the beginning of the cook time may make the color of the beets fade during cooking, while baking soda promotes a deep purple color in the cooked beets. Long cook times can diminish the nutrients, so fresh beets should be boiled or steamed for 15 minutes or less, and one hour or less when roasting. 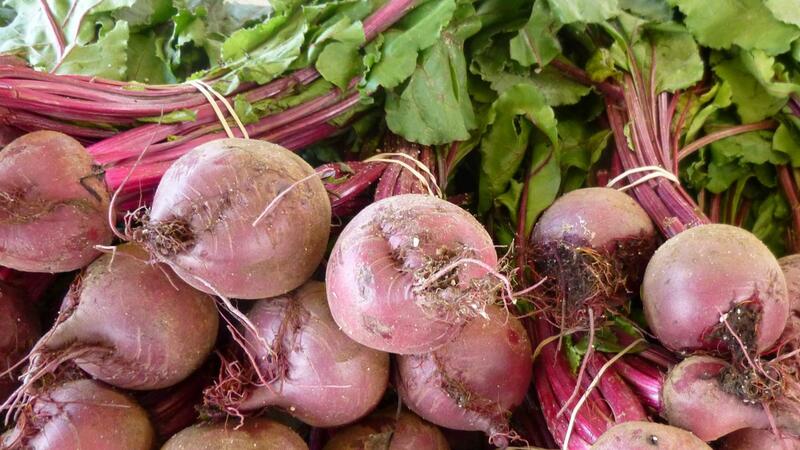 Fresh beets are delicious on their own or served simply with a light vinaigrette as a side dish. Thinly sliced cooked beets topped with a high-quality goat cheese make wonderful appetizers. Grated fresh beets are a great addition to a salad, and roasted beets purée easily to make a soup that's great for the winter months. Beets are also delicious when lightly pickled or roasted and tossed with sautéed greens and crumbled bacon. What Is an Easy Recipe to Saute Red Cabbage?